Sure people all over the world don’t understand why Yemen, Syria, and Iraq are ruined? and Why terrorists destroy archeological sites instead of looting them? The answer is simply “unwanted History”. The Promised Land to Abraham was shown to Moses while he was on the top of mountain in Yemen after he received the Written Torah (the Five Books of Moses only); and the Exodus was from Ethiopia to Yemen via Bab El-Mandeb in 1438 BC. The Promised Land was Asir region, in Saudi Arabia. They never went to Egypt. The Israelite rejected the gift of God and forged the Scriptures. They invaded and colonized Canaan without any reason. Joseph was sold four times, the first was in Yemen and he ended up to be raised in a rich Ethiopian house. Later he was imprisoned then became the king’s chief assistant in a small Ethiopian kingdom. Few decades later the Israelite fled drought and lack of pastures in Yemen to Ethiopia and they were treated with generosity and given land in Ethiopia. They stayed in Ethiopia for more than 400 years and they married Ethiopians. The Israelites became aggressive and caused troubles and another junior king ordered their evacuation and expulsion. They were not allowed to take with them Ethiopian gold, silver, and cattle. The Israelites refused and took them in their Exodus. After few centuries in 605 BC Turkic Persians defeated the kingdoms of Judea and Samaria and in 585 BC took 300 from the ruling house of David captives to Neo Babylonia and after 60 years Turkic Persians sent hundreds of thousands of Turkic settlers claiming that they were the decedents of the ruling house of David. Those new settlers were called Jews. The Turkic Persians replaced the Torah with the Talmud and controlled the Israelites with the Jews. The Israelite were forced to divorce and marry the Turkic Jews and made it among their new unholy laws. The Israelite were unfaithful and the Jews were criminal. The Jews are not a nation, ethnicity or religion. Jewishness is a political association and culture, the older form of Zionism. When Jesus came the Jews were furious and hostile fearing Jesus will free the Israelite and reveals the corruption and foreign origin of the Jews. That is why the Jews crucified Jesus. On this basis, it is very important to draw clear distinctions between three different groups. 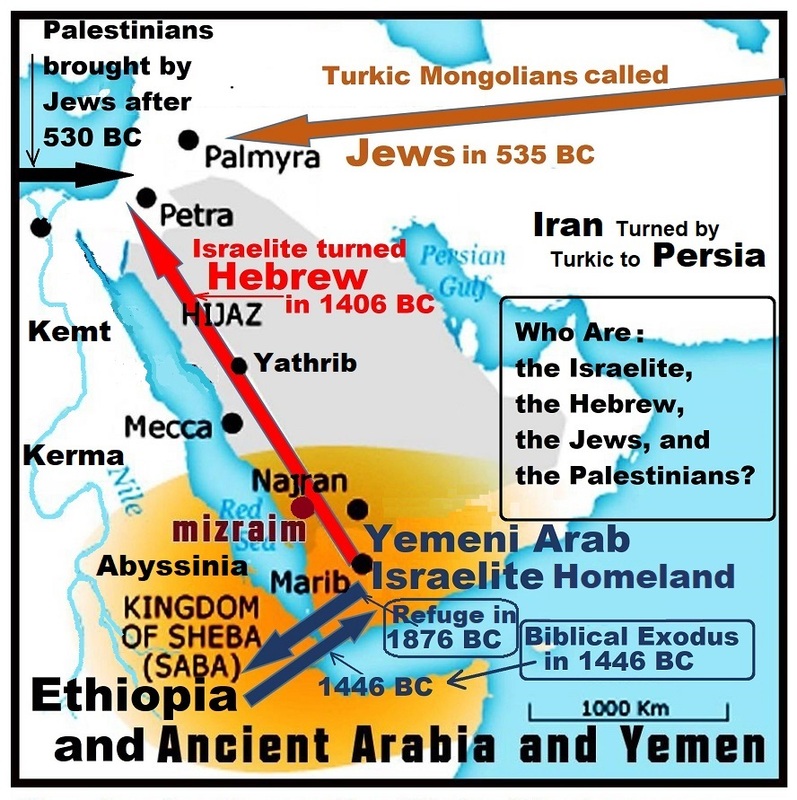 First: the ancient Hebrews “sons of Israel” and who remained faithful to the scriptures, few of them are in southern Arabia, Yemen, and Ethiopia. Second: the unfaithful ancient Hebrews “sons of Israel” who invaded, colonized, and mixed with the Canaanite. And third group: the “Jews” and “Judaism” who were invented by Persia after a fraudulent return from the Babylonian Captivity, present day Jews. There three groups differs from each other substantially in ethnicity, culture, faith, language, and legality. The only genuine true teachings of Moses and Jesus can only be found in Ethiopia together with Ark of Covenant. Modern day Israel and Israel at the time of Jesus both are illegitimate creatures. The modern was made by Turkic Persian invaders and colonizers, and the older was made by unfaithful Israelite invaders and colonizers. The Promised Land that the unfaithful Israelite rejected is surely in Saudi Arabia, between Mecca and Yemen. Ethiopia was only a refuge for them for more than 400 years. And Ethiopians were very generous to them. The Israelite didn’t set foot on Egyptian soil. There are no remains, no writings, no mention in all records, and no possibility to accommodate cattle herders in a country like Egypt. There was never a walled city with gates in Egypt. The geography and names are irrelevant to Egypt, but much related to Yemen and Ethiopia. Researchers say the DNA of Yiddish speakers may have originated from four ancient villages in north-eastern Turkey. They also proved that Yiddish is not “bad German”, but it is a Turkic language mixed with Hebrew, German, Persian, and East European. It can be stated with confidence that the Jews of northern and eastern Europe – normally known as Ashkenazim Jews – are the descendants of earlier Turkic raiders mixed with enslaved natives from the regions all around the Black Sea from Volga-Don rivers to Anatolia, Balkan, and Thracia in 650 BC. At that time they were pagan Tengeri. Judaism (Talmudic Pharisees) was not yet invented as it began to form since 530 BC and continued till 220 AD. But, Moses’ faith (the written Hebrew Scriptures) existed before that time by about 550 years, since 1200 BC. The Turkic raiders and colonizers of Eastern Europe were not called Jews by that time. Ashkenazi Jews became organized Jews in a political group only after 650 AD when they received members form other Turkic groups who came from Arabia, Levant, Mesopotamia, and Persia with the start of wars with Arabs in those regions. All of the new comers to the Turkified Eastern Europe were politically Jews, as they were established in Judea and Samaria by the Turkic Persians. They were ethnically Turkic Mongolians, and religiously followed Judaism (Talmudic Pharisees) to rule over the Hebrew Sadducees and Israelite. The combined Turkic groups worked together both from within and from the outside Arabia and Levant to stop and influence Islam and finally to control it. Genetics and linguistic research proved that Turkish villages –Iskenaz, Eskenaz, Ashanaz, and Ashkuz were part of the original Ashkenazic homeland. It is believed that the word Ashkenaz originally comes from Ashguza – the ancient Assyrian and Babylonian name for the Iron Age Eurasian steppeland people, the Scythians. Unfortunately, geographical name changes in Turkey have been undertaken, periodically, in bulk from 1913 to the present by successive Turkish governments. Thousands of names within the Turkish Republic or the Ottoman Empire have lost or departed from their popular or historic alternatives. The governments have argued that such names are foreign and/or divisive against Turkish unity. The policy commenced during the final years of the Ottoman Empire and continued into the Turkish Republic. Approximately 28,000 topographic names were changed, which included 12,211 village and town names and 4,000 mountain, river, and other topographic names. The name İşkenaz was changed to Skena and many other name changes were enforced. While it is clear that the Israelite presence and Exodus from Egypt never happened there are explanations for geographic name similarities (copying) between Asir and Palestine, as Prof. Salibi proved. It is most probably that the unfaithful Israelite who rejected Asir renamed many places in Canaan to match those in the original Promised Land in Asir to make their case stronger. Research and analysis of the Old Testament place names, corroborated by contemporary Pharaonic and Mesopotamian sources, Kamal Salibi locates the ancient land of Israel, not in Palestine, but in the Najran province of what is now Saudi Arabia. The unfaithful Israelite rejected the original Promised Land then after sometime invaded Canaan and claimed it is the Promised Land. And to convince the Israelites renamed many places with names from the original Promised Land in Asir. Thus, as the ancient Hebrews became extinct through their assimilation into other peoples, the religion founded by Moses disappeared. The Hebrew Judges and prophets continued to spread among other peoples who had no connection with the original Hebrews of the Old Testament. In the Israelite leaders created alternative Promised Land and unholy scriptures. Then few centuries later the Turkic Persian took over that land for the Turkic Jews and invented Judaism. It is also important to notice that The Implication, of course, is that the Jews of today are not descendants from the Old Testament tribes and, consequently, that they have no claim to the “Promised Land”, whether it is located in Palestine or elsewhere. After looking through a gazetteer of Arabia given to him as a gift, Kamal Salibi was struck by the number of biblical place names found in the province of Asir. 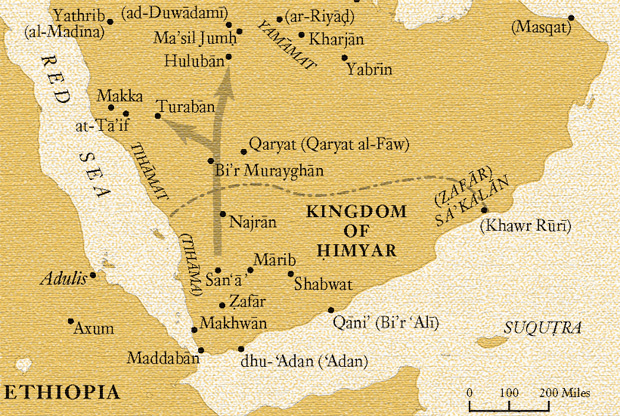 To satisfy his curiosity he correlated the names of places to the distances travelled according various Old Testament books of the Bible, and found that there was a close correspondence in the distances between all places in Asir and those in the Old Testament, not the discrepancies found between such places in Palestine. His research led to the publishing of his first book on Asir, The Bible Came from Arabia and to some scholarly resistance but mostly to his ideas being completely ignored by the academic world. Moreover, when one remembers that Jerusalem in Palestinian Israel is often referred to as “the daughter of Jerusalem”, one feels there may indeed be an original Jerusalem here in Asir. Unfortunately, to date there has been little archeological research in Asir, though the state is replete with ruins. How fascinating it would be if the Promised Land did turn out to be Asir. Through a minute analysis of Old Testament place names, corroborated by contemporary Pharaonic and Mesopotamian sources, the author locates the ancient land of Israel, not in Palestine, but in the Najran province of what is now Saudi Arabia. Professor Kamal Suleiman Salibi (Arabic: كمال سليمان الصليبي ‎‎) (2 May 1929 – 1 September 2011) was a Lebanese historian, professor of history at the American University of Beirut (AUB). “Palestine is not the Jews’ Promised Land” (2015 book) by Dr. Ashraf Ezzat, available on US Amazon for only ($4.99) and at a lower price on Kindle Unlimited. Here are four published articles describe the findings of a research and contradicts earlier theories that Yiddish is an old German dialect or of any European origin. The study, titled “Localizing Ashkenazic Jews to primeval villages in the ancient Iranian lands of Ashkenaz” was conducted by researchers from three universities in the U.K., U.S., and Israel. It was published in the journal Genome Biology and Evolution. Important Notice: The four articles, for unclear reasons, try to justify the Turkic presence in the region with trade along the Silk Road, while ignoring the raiding, colonization, and enslavement of Western Asia, Eastern Europe, the Caucasus, the Balkan, and Anatolia. The creation of the Slavic group, the mass migration and invasions of the Sea people, and the simultaneous collapse of several great civilizations that occurred in 1177 BC all might be linked to earlier Turkic raids. A bit long today, Tariq. But, what of the people who will assert that the account in Exodus is allegorical and not to taken literally? If Exodus does not represent actual events, does it matter that much where the Promised Land was (alleged to be)? Yes indeed, I don’t like long articles but I meant to give more answers. Actually it is two articles combined. The Exodus existed but it was not in Egypt and it was not slavery as alleged. I tried to draw clear distinction and prove that there are three different groups we wrongly call them Jews. (Israelite of Moses, Israelite of Judges, and Turkic Jews). You are right larryzb, I made it shorter. Sorry I was too busy yesterday to answer correctly. 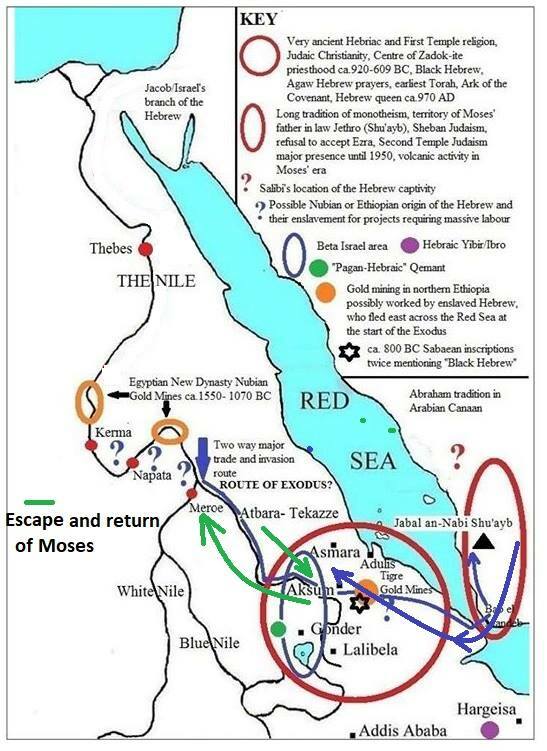 For the Exodus/Flee deniers the writings of Bernard Leeman provide a lot archeological, historic, linguistic and cultural evidences of Hebrew Israelite long presence in Ethiopia. Genetics can also indicate the settlement in Ethiopia. The event of Exodus/Flee itself can be traced once the occurrence of Ethiopian refuge is confirmed, which is the case. The opinions in this article are mostly my own investigation and they are initially based on researching the history of Turkic groups and the creation of Persia in Iran. Other supporting sources are mentioned in the article. Fairy-tale genocidal God promised what to whom? God is wrongly accused by false claims made by unfaithful Israelite who rejected the original Promised Land in Asir and then the lies were carried on by Turkic groups. God never promised Canaan and never condone invasions, colonization, or genocide. I haven’t seen any proof myself that the Yiddish language comes from Turkic, neither anything with their DNA. They do have a lot of J1c and E3b, both that are actually common in Arabia. Care to elaborate a bit more? Even David Duke refused to corroborate the Khazar theory simply because there was not enough to justify it. Also are you saying that landmarks like Masada, Mount Gerizim, the Wailing Wall and etc. that were detailed as being in Judea by the Romans actually had nothing to do with the Hebrews? So the New Testament was actually not about Hebrews at all? I guess there are a number of my articles here are also dealing with the invention of the Oral Torah, the Talmud, and the Turkic influence in Christianity, Rome, Vatican, and St. Paul. The Punt Lands Hypothesis is very strong indeed, and will prove to be correct, and shall change world’s history and religious believes totally and very soon.